During the course of the last year or two, I've met many public relations specialists. I've written press releases for some, and for others, I've handled media outreach and story pitching. In nearly every instance, social media was an afterthought. They either didn't "get it," or they didn't think it was important, and it surprised me that I had to deliberately bring social media up, as if it hadn't been the fastest growing phenomenon since sliced bread. "I don't like Twitter," I heard a lot. Or even worse, "my client doesn't like Twitter." "Facebook is too confusing," I heard. Or, "I don't know how to do video." Sometimes, I heard the opposite comment, that pr firms expected social media to transform their lives, and provide instant results for their clients. Wrong mindset! Social media is used to build online community and brand. It can be about selling eventually, but people buy from those they know and trust, and that can take a while. Not only that, but if your audience senses you're trying trying to sell to them too quickly, or they haven't gotten enough value from their connection, they're going to sign off and tune out. Social media can best be used to enhance the public relations activities you already have going on, much in the same way it's used to enhance traditional marketing. Think of it as the dressing on your salad! Here are a few tips on how to enhance your pr efforts with social media, for press releases and events specifically. 1. 0n the press release, include not only your client's website, but any of their social media profiles. If they don't have any yet, set up a Twitter profile at the very least, and start following relevant people or organizations of interest. You can also use Twitter to set up a hashtag for your event or news, which will help establish a social media online "trail." 2. Make sure to include the Share button on your release, to make it that much easier to spread the information. 4.Graphics always enhance and liven up your releases, so include photos in the body of your release, with a link to your Flickr set, if you have one. Press releases with video and YouTube links have been proven to get more traction then those without, so take every opportunity to add multimedia when you can. 5. In order to build buzz, try introducing a social media contest in the weeks before an event, where your community can earn a prize or a discount by retweeting or sharing your information. You can award the winner at your live event. Encourage social media posting during the event to build online brand, as well as SEO. 6.Use your own company blog if you have one, to publish your release and info about your event, and use SEO techniques to heighten your online visibility. A strategically written blog post may also contain links to other companies and individuals, who will ultimately see that you linked to them, thus increasing your brand awareness. This recently happened to me on a blog post I had republished as a result of Peter Falk (Columbo's) death. I had linked to Radian6, and their community manager saw the mention and retweeted my post! 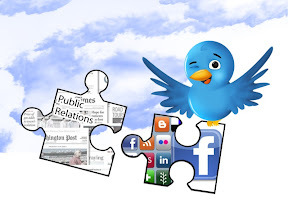 These are just some of the ways you can integrate social media with PR tools. Please post in the comments if you have any other experiences or ideas. Right on the money again. Building a brand's image and community using social media takes time. It isn't going to happen overnight so expecting to see instant results isn't really realistic. The best way to use social media is in addition to what you've already go going on. Great post and thanks so much for giving us a mention! You're welcome, Trish, and thanks for the affirming comment! I just love you folks at Radian6! Correct. What most professionals fail to remember is that you must generate content for the users (intended market and potential customers) not for the search engine. Although SEO is important, at the end of the day the quality of the content is still the primary criteria of whether you can capture the market or not. The more desirable ones are definitely those that which can attract "quality attention." Excellent point, Sreeni! Thanks for commenting. Quality comes first, absolutely. I find I have to explain this sometimes when people want "SEO" writing. We write for people first.